Professor Stephen Hawking spoke at Harvard’s Sanders Theatre Monday on an array of interstellar topics. CAMBRIDGE — Black holes aren’t as black as they have been described, and though light can’t escape them, there may be a way out — potentially through a portal to another universe. That was the main point of a lecture given Monday afternoon at Harvard University by Stephen Hawking, the legendary physicist and author who was visiting from England to help launch a research center on black holes. To a rapt audience crowded into the university’s august Sanders Theatre, Hawking spoke through the robotic voice of his computer, his long silences punctuated by a combination of jokes and ponderous thoughts about the universe. 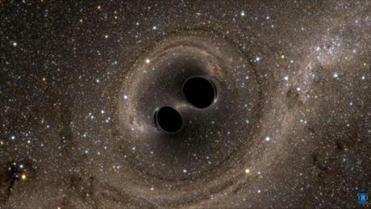 A team from MIT spearheaded the landmark discovery, which marked the first time scientists had detected gravitational waves. Hawking, director of research at the Centre for Theoretical Cosmology at the University of Cambridge in England, spoke for about an hour, spanning the history of physicists’ understanding of black holes, which are thought to form most typically when a massive star exhausts its nuclear fuel and collapses under its own gravity. Hawking said it took many years before he concluded that black holes do exist and emit particles, noting that Albert Einstein doubted their existence. “Black holes are stranger than anything dreamed up by science fiction writers, but they are firmly matters of science fact,” he said. 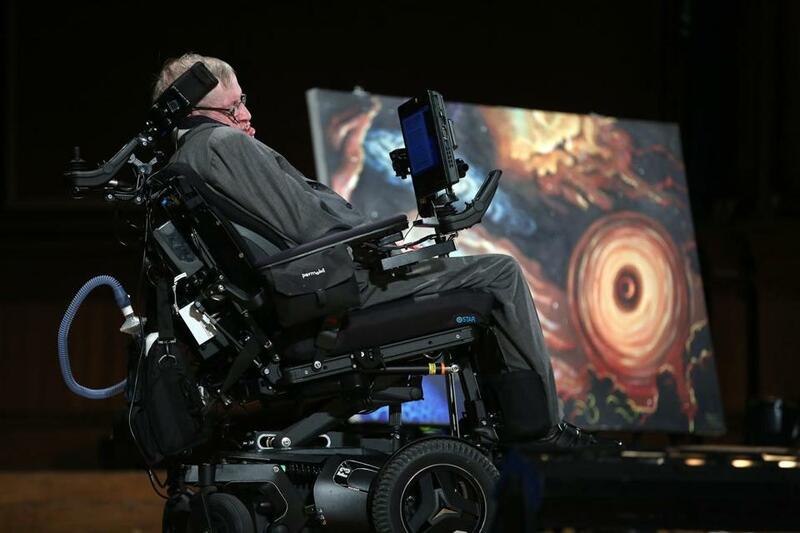 Hawking, 74, has a rare form of amyotrophic lateral sclerosis, or ALS, that has gradually paralyzed him over the years. He speaks by using a single cheek muscle attached to a speech-generating computer and delivered his lecture from a special wheelchair. He and other professors at the lecture noted that the recent discovery of gravitational waves — led by researchers at the Massachusetts Institute of Technology — provided some of the first concrete evidence of the existence of black holes. That discovery, revealed in February, came as a result of a multimillion-dollar experiment that captured the sound of an explosion of two massive black holes about 1.3 billion years ago. Two observatories in the United States heard the explosion as it passed the Earth in ripples known as gravitational waves. Hawking said it’s possible that black holes could be as massive as the distance from the sun to Jupiter, which would have a diameter of about a billion miles. But he said they could also be relatively tiny, such as the size of a mountain. It also may be possible for humans to create minuscule black holes, as scientists have been experimenting with at the particle accelerator known as CERN in Switzerland. If the scientists do discover that they can create a black hole, Hawking joked, he should win a Nobel Prize. Hawking has been focusing on understanding one of the lingering mysteries about black holes: what happens to the matter that gets sucked into them. He said it’s also possible that the matter is sent to another universe, making it seem like it disappeared from our universe. “Although I’m keen on space flight, I’m not going to try that,” Hawking joked again. “Exactly how they are able to store so much information is one of the greatest mysteries that we’re working hard to unravel,” he said. In advance of his lecture, Hawking received several questions. In one, he was asked about his recent announcement that he was backing a team that plans to send tiny space vessels to Alpha Centauri, the star nearest to the sun. The team plans to use high-powered lasers from Earth to propel iPhone-sized vessels that could travel up to one-fifth of the speed of light and take just 20 years to cross such a vast distance. Hawking noted that humans have yet to find anywhere close to our planet that could support our existence. “To find somewhere like the Earth, we have to boldly go to the stars,” he said. When he was finished, Hawking received a long, standing ovation. Some found his lecture perplexing, as impenetrable as a black hole. Rebecca Lee, 26, a premed student at Harvard’s Extension School, ended up at the lecture by accident. “Some parts of the science were just way beyond me,” she said. Others were just moved to hear a man they consider the greatest living scientist.